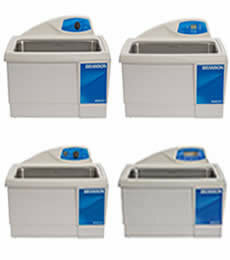 The PC-620 is offered in 2 frequencies to match cleaning capability to your application. At 40kHz it is ideal for cleaning pipettes, lab glassware, and other items requiring general cleaning. Branson's innovations include a signature elevated control panel, positioned above and behind the bath to avoid damage and increase operator safety. 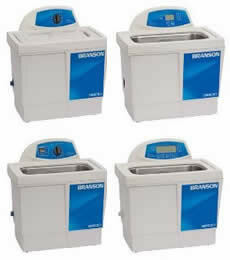 With a unique sweep frequency technology to eliminate standing waves, and a pioneering 40 kHz industrial transducers, Bransonic ultrasonic baths have been the industry standard for quality, reliability, and precision cleaning. 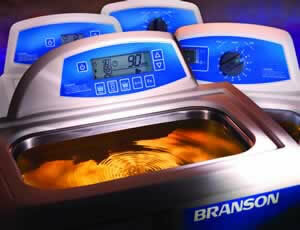 Advanced technology and digital performance in our most robust, versatile, ultrasonics baths. Constant activity/power tracking automatically maintains the same ultrasonic power by adjusting for changes in liquid level and temperature caused by a light or heavy load. 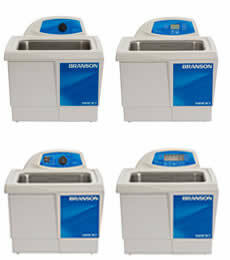 This helps ensure more uniform cleaning and consistent performance, even with multiple users or when bath conditions change. 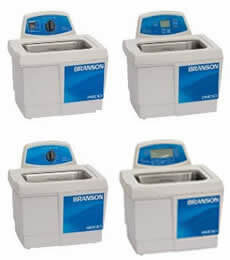 Assures uniform, precision cleaning over the entire surface, and consistent cavitation that reaches and cleans even tiny crevices on the parts. High/low power control adjusts the acoustic energy in the bath. It can be set at 100% power for normal to heavier loads, or at 70% power for lighter and more delicate applications, helping to protect delicate components from potential damage. Temperature settings are available up to 69°C/156.2°F, which can be set in either Celsius or Fahrenheit and programmed through the front panel for easy access and monitoring. This also allows for convenient re-calibration when needed onsite. Sleep mode provides energy savings automatically by shutting off unit if control keys are not touched within 15 minutes of cycle end. To restart, press any key. 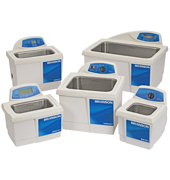 Degassing and conditioning of solutions through advanced wave modulation of up to 99 minutes also allow for a variety of sample prep applications. 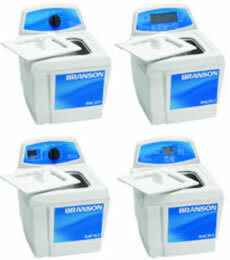 Standard power requirements for all of our ultrasonic units are 120V, 50/60Hz. All units are available in 230/240 volt, 50/60Hz. All of our units come with a tank cover. Available accessories shown in the image to the right are the solid tray, perforated tray, mesh basket, and beaker cover. Also avalable is a support rack that is placed on the bottom of the cleaner. Made from stainless steel. Keeps small parts together when cleaning ultrasonically. A spring handle applies firm pressure to the basket to keep it closed when in use. Its overall length is 6". Spherical basket has a 1½" (38mm) diameter. A unique plastic coating on the tips of the tweezers insulates them and provides resistance to heat and chemicals. Ideal when cleaning with ultrasonics.